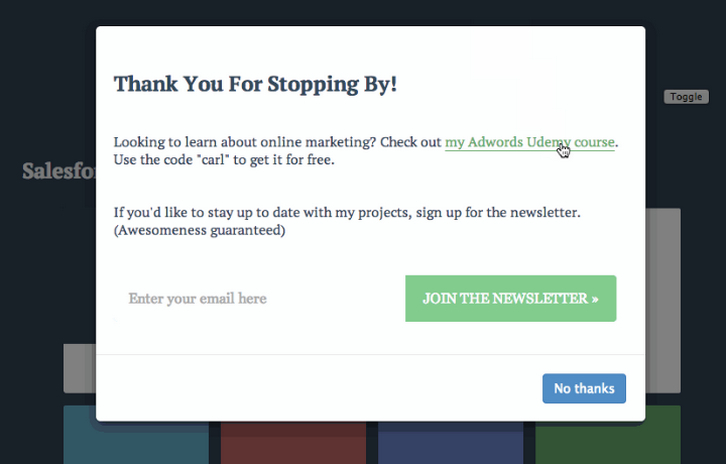 Ouibounce is a small library enabling you to display a modal before a user leaves your website. This library helps you increase landing page conversion rates. Ouibounce fires when the mouse cursor moves close to (or passes) the top of the viewport. You can define how far the mouse has to be before Ouibounce fires. The higher value, the more sensitive, and the more quickly the event will fire. By default, Ouibounce will only fire once for each visitor. When Ouibounce fires, a cookie is created to ensure a non obtrusive experience. Please use Ouibounce to provide value to your visitors. With tools like these it’s very easy to create something spammy-looking. Note to potential implementers from an early-adopter consumer: if you do crap like this, I will most likely NEVER go back to your site. definitely, I hate it and i’m sure prety mutch every one hates it when you try to go to other site or close a site and – BOOM!!! “wait wait don’t leave us! we’re so desperate that we started begging people” no one likes to relate to those that are desperate. This is a terrible idea. Please don’t use this.